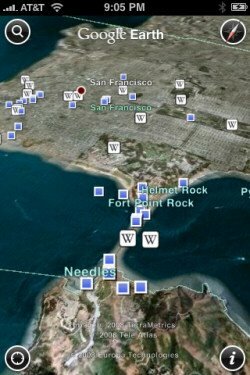 The first desktop application ported by Google to a mobile phone is Google Earth. iPhone and iPod Touch users can download for free from the App Store the best way to explore satellite imagery in 3D. "Not only is having Google Earth on your iPhone convenient, but the touch interface is a very natural way to interact with the Earth. Just swipe your finger across the screen and you fly to the other side of the globe; tilt your phone and your view tilts as well. You can pinch to zoom in or out, or just double tap with one finger to zoom in and two fingers to zoom out," says Google LatLong Blog. CNet writes that iPhone's multitouch makes the experience much more intuitive than in the desktop version of Google Earth. Like Google Maps for Mobile, the application can detect your location using information from GPS, Wi-Fi networks, and mobile phone towers. You can explore interesting places and discover more about them using the integrated layers: Wikipedia and Panoramio photos. The cool applications that were only available from your computer start to be ported to mobile phones. In the future, the most exciting applications will be first launched for mobile phones. it's okay. It's fun to play with for a bit but it's also a bit tricky at times too to do what you want it to do. How come it is not available in the philippines? Or in some europe countries , like Macedonia?